Bond Voyage to everyone heading to the Amish weekend rides! 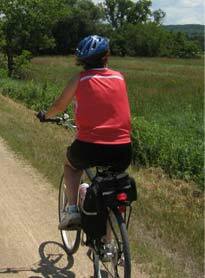 For the rest of us, please join me on a ride down the Fox River trail from the Depot in East Dundee to the Pate Philips park on Stearns Road for a rest room break. We will return on the Prairie path. Around 22-25 miles. The start point is the “Depot” 319 N. River Street, East Dundee. We will start at 9:30, so be there at 9:15 to sign-in. Should be a fabulous day with weather in the mid 70’s dry and only 4mph wind. Please let me know if you are coming so no one is left behind. Casual ride at your speed. start point is the “Depot” 319 N. River Street, East Dundee. We will start at 9:30, so be there at 9:15 to sign-in.